This private safari gives you an in-depth view of the natural history of Tanzania, with a special emphasis on both wildlife and migration exploration. 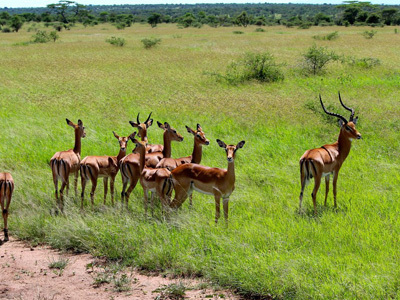 The routing was designed to allow the best possible opportunities for game viewing during the months of December to March. Featuring Lake Manyara, Ngorongoro Crater, Ndutu as well as the Central and Northern regions of the Serengeti. This morning, you will be met at your hotel to begin your epic safari adventure! 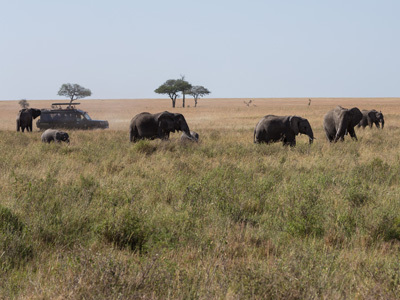 From Arusha, you will leave with your English-speaking professionally-trained guide/driver, in your 4WD Land Cruiser (or similar) with a pop-up roof for game viewing. Start the day off, with driving to Lake Manyara in the great Rift Valley. Entering this region, you will take a game drive around Lake Manyara National Park. Famed for its unusual tree-climbing lions, it also has a large elephant population, rich bird life in the forests and thousands of flamingos on the soda lake. This morning, you will descend into the Ngorongoro Crater floor for game driving and exploration. Ngorongoro was a huge active volcano, probably even larger than Kilimanjaro, when the volcano erupted some 8 million years ago. It's cone collapsed, leaving a crater, or more appropriately a “caldera”, 600m deep, 16km across and 265 sq km in area. Enjoy the spectacular scenery and game viewing, in what has been described as the eighth wonder of the world. Many of Tanzania’s last remaining black rhino can be seen grazing on the open grassland of the crater floor, surrounded by some of the 20,000 large animals that occupy the crater, including lion, cheetah, eland, zebra and gazelle. Flamingo, among other bird species, can often be seen feeding at Makat Soda Lake as well. 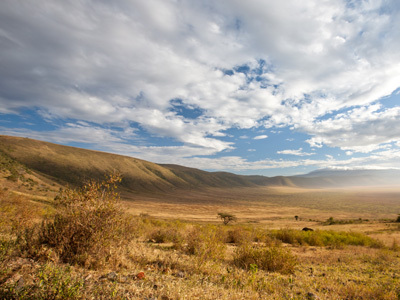 Ngorongoro Crater is one of Tanzania's most amazing sights: a collapsed volcano which forms an incredible natural amphitheater, 25 km (16 mi) across and teeming with all of the African big game. Many of Tanzania’s last remaining black rhino can be seen grazing on the open grassland of the crater floor surrounded by some of the 20,000 large animals that occupy the crater, including lion, cheetah, eland, zebra and gazelle. Flamingo, among other bird species can often be seen feeding at Makat soda lake. This is an area of spectacular beauty and superb game viewing, a truly unique safari destination. Today, you will explore outside of the greater Ngorongoro Conservation area and head to Ndutu, on the edge of the Southern Serengeti. Exploring this area and admiring the wildlife in their natural habitat offers a new adventure every day. This region is home year round to an abundance of wildlife, which you will get to experience away from the crowds. From December to March, this area is especially known to catch a glimpse of the Great Migration. During your stay here, you may also be interested in visiting the historic Olduvai Gorge and Museum. You can learn about the famous archaeological sites and visit the informative museum, where you can see first hand where early human tools and fossils were discovered, including "Lucy." These incredible documents of our evolutionary history is unique to this area. Criss-crossed with forested river valleys and vast plains, the Serengeti plays home to millions of Africa’s large mammals, making this one of the world’s most famous wildlife destinations. In addition, since the Ndutu region is not part of the actual Serengeti National park boundaries, the rules and regulations regarding game driving are much more flexible. 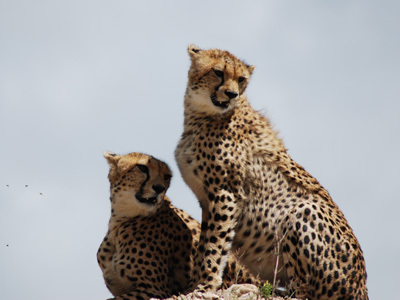 Get up close and personal with the wildlife here like no where else in Tanzania. Spend these days game driving in the rolling grasslands of Ndutu, located in the southern region of the Serengeti. Criss-crossed with forested riverine valleys, the Serengeti plays home to millions of Africa’s large mammals, making this one of the world’s most famous wildlife destinations. Today you'll game drive into the Serengeti. The Serengeti National Park is probably the best place on the planet to spot large game. Your three days here will be spent on different game drives searching for prides of lions, cheetah, leopard and much more. In the evening you’ll return to your beautiful tented camp for stories and dinner. *Flight not included, pricing subject to dates and availability. After your final morning game drive you'll depart for the Lobo airstrip where you'll board your flight back to Arusha. Depending on your international departure flight time we can arrange for a day use room in Arusha or alternatively a direct transfer to Kilimanjaro International Airport. Perched high on the rim of the Great Rift Valley, Escarpment Luxury Lodge is a serene haven overlooking the wonder of Lake Manyara below. This lodge features the best of the African bush. Wide open expanses of windows and doors offer the opportunity to appreciate the pristine surrounding nature at all times. Whether you are lounging on the deck of the main lodge, or enjoying the comfort and privacy of your own luxurious en suite chalet, you are invited to make the most of this idyllic destination. Watch pelicans sweep through the sky, as you sip on sundowners, admire the sun disappear behind the majestic hills and listen to the sounds of Africa. Welcome to the wild! Nasikia Mobile Migration Camp brings you close to the action and its unique location is determined each season, according to the dynamic movements of the wildebeest mega herds. From December to March, Nasikia is situated at the Small Marsh campsite in Ndutu, where you will find yourself in the midst of the short-grass grazing season with calving during late January. From July to October, the camp is located at Bologonja in the northern Serengeti - an ideal position from which to see the herd brave the crocodile-infested waters of the Mara River. The mobile camp is comprised of 8-12 solar powered tents made from heavy duty safari rip-stop canvas. Each tent has a spacious bedroom and patio area for relaxing. The bathroom includes a ceramic wash basin with running water, a supply of natural based bathroom products, and a flushing toilet. Shower under the African skies with a 20 liter shower bucket put up on a pulley system as you require. The camp provides guests with a Lounge Tent complete with library to relax in and a large Dining Tent to enjoy sumptuous bush cuisine, cooked up by the camp chefs from fresh produce taken from all corners of Tanzania. Don't worry about having to choose between sipping on a drink, while admiring endless views across the magnificent southern plains of the Serengeti, versus kicking your feet up in a tented suite, while listen to the calls of the wild, because at Naona Moru Camp you can do both! Alongside the opportunity for many more incredible experiences,this intimate camp of seven tented suites provides a luxurious and unforgettable stay. Combine crisp white sheets, gentle Serengeti breezes, running hot water, utmost comfort, hospitable service and WiFi - this is how wild elegance is served. Perch yourself on the veranda to watch the sun set on the horizon, or take a hot shower after a day of safari exploration. Located on an elevated viewing point beside the famous Moru Kopjes, this tented camp allows for drive in and game package clients to explore the resident and migratory wild game all year round. The landscape pans from the great southern plains of the Serengeti into the central hub of the most famous national park in Africa, close to Seronera Airstrip.